Being an entomologist means that my scientific point-of-view is literally down-to-earth much of the time. But like just about every scientist whom I know, I am completely fascinated by space exploration. This morning, I read that Opportunity, one of NASA’s Mars rovers, has likely completed its mission. This is a big deal for a number of reasons, and in particular because the mission was only expected to last a few month but has gone on for 15 years. That, in itself, is a major engineering accomplishment. Add onto it all of the amazing research that has been done in that time, and you can see why this NASA mission was a roaring success. I have, in the past, measured the temporal run of my scientific career in comparison to space missions. Voyager took me through my grade school years and is still going. The Mars Rovers have taken me through most of my postdoctoral and tenure track years. Opportunity launched in July of 2003, right as I was completing my first postdoctoral stint at UBC and was planning on moving to California for my second. Since then I have completed that second postdoc, landed a position at UNBC, and moved through the various professorial ranks. But Opportunity, like all other space missions, and indeed all other science, is a great reminder that this entire endeavour of discovery is a massive team effort. And for me, hearing the news of Opportunity’s demise this morning (its last message was along the lines of “I’m running out of battery power and the darkness is closing in”) was a reminder for me of all those who I have to thank for helping to get me this far, and for working alongside me in the past and present. I know that a list like this will never be complete, but I’m going to attempt it because fear of missing someone shouldn’t stop me from thanking these people. Please know that if I missed you, it was not intentional. Of course some of my biggest thanks go to my mom and dad who encouraged my love of biology from a young age and who have been constantly there through the ups and downs of graduate school, uncertainty about ever landing a job, stress about the tenure track, and the various ups and downs that continue each year. I love you guys and I’m glad that you’re only a phone call or a reasonably short drive away. Thanks to Dr. Gerrit Voordouw at the University of Calgary who took me into his lab for a couple of summers during my undergraduate zoology degree. That research experience, including my first publication, helped me to make my choice to work towards a career in the business of discovery. What an amazing opportunity! Thanks to all of my undergraduate professors, and to a few in particular. Dr. Robert Barclay taught me how to integrate basic information into complex ideas in an animal behaviour course and whose lecturing chalk skills are phenomenal. Dr. Robert Longair and Dr. Ralph Cartar showed me the world of invertebrates and stamped my heart with a desire to learn more about them. Dr. Elisabeth Dixon told us about chemical ecology as a bit of an aside in her organic chemistry course one day, and at that moment sparked my lifetime fascination. Thanks to Dr. John Borden, my Ph.D. advisor. John took a chance on an untested student straight out of his undergraduate degree. He told me that a Ph.D. is as much a process of maturation as it is of discovery. He provided guidance and funds and a continual stream of great ideas. He taught me how to be organized, how to prioritize multiple tasks, how to give an effective presentation, how to write a publication-worthy paper (depleting many red pens in the process), and how to approach the scientific endeavour with a continual smile. John, I truly appreciate your continued mentorship after all of these years. Thanks, also, to a bunch of other academic mentors from my time as a Ph.D. student at Simon Fraser University, whether as graduate course instructors, or as instructors in courses that I TA-ed, or in other contexts. These individuals include Dr. Gerhard Gries, Ms. Regine Gries, Ms. Tammy McMullan, Dr. Mark Winston, Dr. Larry Dill, Dr. Bernie Crespi, Dr. Elizabeth Elle, and Dr. John Webster. You each taught me important things about natural history, about surviving in academia, about the practice of teaching, and about professionalism. Thanks to Dr. Jörg Bohlmann for getting me involved in great projects that truly stretched my thinking and my technical capabilities during my postdoctoral time in his lab at UBC. Thanks also for all of our many past and ongoing collaborations, for our friendship, and for teaching me about approaching both basic and applied science with vigor, passion, professionalism, and kindness. Thanks to Dr. Steve Seybold who gave me the opportunity to experience science in another country and to see how things operate outside of academia. Thanks also to Steve for demonstrating a deep commitment to getting the details correct and for exemplifying a love of forest natural history. Thanks to Dr. Chris Fettig who kept me going in non-host volatile work, who is an example of professionalism, and who continues to be a supportive colleague. Thanks to both Steve and Chris for their ongoing, valuable interactions that help to stretch my thinking and for their friendship. Thanks to Dr. Staffan Lindgren who noticed my talk at a WFIWC meeting in San Diego and suggested that I apply for an open position at UNBC. Thanks, also, to Staffan for the years of mentorship that continue to this day even though he has retired to somewhat warmer climes. I miss you being here at UNBC, Staffan, but I’m glad that we get to see each other on occasion. Thanks to UNBC for hiring me and for the many opportunities that I’ve had here over the past 13 years. Thanks to Dr. Keith Egger who was the Program Chair when I arrived and helped me to get my feet on the ground. Thanks to Dr. Kathy Lewis who has been the Program Chair for the majority of my time here at UNBC and who has been an amazing example of gracious, kind, and fair leadership. And thanks to my many colleagues at UNBC who have been great mentors and friends through the inevitable ups and downs (mostly ups!) of institutional life. Thanks to my colleagues beyond the walls of UNBC who have encouraged me, collaborated with me, written proposals with me, published papers with me, organized symposia with me, tweeted with me, and had a beer or two with me. While not without faults (let’s work on those!) our community of entomologists and ecologists is something special. And finally my definite biggest thanks to my wife, Joyel. We were married about a month after the launch of Opportunity, and we moved from BC to California almost immediately thereafter. I know that it’s not always easy being the spouse of an academic with the uncertainty about the next job, the moves to who-knows-where for said jobs, and generally weird (but thankfully generally flexible) schedules. There’s no way I could do the work that I do without your support. I am certain that I’ve missed some people here, and this blog post will likely grow with edits over the years. While Opportunity is now cold on Mars, my heart was warmed today thinking of all of you who have influenced me during its time of exploration. In other words, the free market is great, except when it isn’t. The “free” use of air and water to dispose of waste is not actually free. Pollution – like any other use of a common resource – imposes costs. But those costs are rarely exclusively placed on the polluter. Instead the cost is divided up among many who rely on that resource for one reason or another, most of whom don’t reap a profit. The polluter – not owning the air or water – has no incentive to steward it. But the polluter does have a massive incentive to a free-riding profit if they are permitted to take that free ride. When governments allow free riding, they are not allowing the free market to work – even if they say that they believe in free markets – because permitting the imposition of costs on others by the polluter is a subsidy to the polluter. Ignore the problem: but eventually the Commons is destroyed. Regulate it: this can work, but this is highly susceptible to intentional rigging in favor of some against others. Impose a cost on use of the Commons, since the Commons cannot be privatized. In a climate context, put a price on carbon emissions. Some combination of the above three options. Option 3 is not without it’s potential issues, but has been proven to work over and over again in a variety of Commons contexts. This is basic economics, and basic game theory. But option 3 also takes political will to implement. Our politicians know all of this, but it seems that many of them would rather play games with our future for the sake of realizing their short-term goals of power. Yes, indeed, let’s do that. But this does not change the economic argument because at some point someone is going to have to pay for the R&D to create the technology, the materials and expertise to build it, and the expertise and energy to run it. Even in this (rather hopeful) scenario, someone still has to pay, and not insisting that polluters pay is a subsidy to polluters. I’ve spent a lot of time around rivers over the course of my decades – fly angling, research, hiking, contemplating. Rivers and streams are, in many ways, the circulatory system of our continents, and they ooze life of all sorts within their flow and along their banks. That riparian life has the tendency to make watercourses in forested areas fairly inaccessible. Forest rivers, in a way, nurture their own (in)accessibility. Any researcher or angler will tell you how valuable a bare few access points along many kilometers of a river can be. There are three things that allow physical access along a flow. The first is the action of the river itself over time carving out seemingly fortuitous access points from the landscape. The second is the cycle of annual weather accompanied by long term climate change that sometimes leaves banks bare of water for intrepid hikers to walk below the high-water line. The third is both ancient and current human activity – the camps, villages, railroads, resource roads, clearcuts, pipeline crossings, and parallel highways that we build, inhabit, and use. Dr. Sarah de Leeuw, a faculty member in the Northern Medical Program and Geography at UNBC, takes readers on a journey along the Skeena River, guiding us to access points along its course in her poetry in Skeena (Caitlin Press, 2015). Along the journey, people, places, animals, plants, and soil weave through the river’s currents, around the roots of its trees, and into its riparian forests. Along the way we hear the stories of the river and by the river. Some of the stories are very old: “(A) story of three/young men felled by frogs a story of Pelemqwae the giant beaver who shot arrows/and felled a chief”. Others – the account of Ali Howard swimming the full length of the river in 2009 – are very new. And then the names along its length flow through the pages in eddies, ripples, and torrents: Wet’sinkwha, Edziza, Kispiox, Gitanmaax, “slow-and-full-of-water-with-lily-roots-thick-as-a-young-doe’s-knee-knuckle”. Who, indeed, chose the names? Was it the river all along? In her prologue de Leeuw tells us that she has “written the river’s voice.” She has made the Skeena’s voice accessible and it flows into its listeners with each reading – leaving us filled with its sensations, stories, and sounds. I grew up in Calgary, which is in southern Alberta. The city itself sits right at the intersection of the Great Plains and the eastern slope of the Rocky Mountain. The Elbow River flows into town from the south and meets the Bow River where downtown now sits. 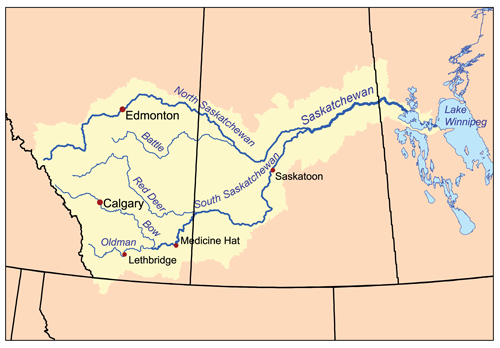 The Bow itself flows from Banff in the west, through Calgary, and to the south and east until it joins up with the Oldman River, which empties into the South Saskatchewan River, which joins with the North Saskatchewan to form the Saskatchewan River. The water that started up in the moutains at Bow Glacier eventually ends up in Lake Winnipeg, and from there in the Arctic Ocean by way of Hudson Bay. My family home was on the edge of downtown Calgary. In that respect you won’t find too many people who had as urban an upbringing as I did. But Calgary is a special place, particularly in its river valleys, because of the easy access that good civic planning (which has thankfully continued to this day) provided a rather “free range” kid like me to urban-wilderness spaces. I spent a great deal of time on the hill outside my house. At a young age — surprisingly perhaps in the contemporary era of nature deficit disorder, but not at all unreasonable in the 1980s — my parents were quite fine with me wandering down winding paths on the hill, fly rod in hand, to the Bow to see if I could rise a trout or two. Family holidays were never at a preprogrammed resort, but were spent in the mountains of Alberta or British Columbia; or on the prairies east of town and out to visit family in Medicine Hat; or further east exploring Saskatchewan. Because of all the time and freedom that I had to spend on my own fishing the Bow, or calling magpies — always and forever my favorite bird — with homemade predator calls in front of my house, or sitting in the back seat for hours on end driving across Canada’s three western provinces on family holidays (and no iPads in the car, of course), I had more than ample time to contemplate the natural world around me. I saw the Canadian Rockies and other ranges, mainly untouched except for ribbons of roads in the national parks, but substantially logged outside of those protected areas. I saw the Bow and the Elbow, and felt the water on my legs rise and fall with upstream dam releases. I caught beautiful brown trout that I knew had been introduced in the past in a mistaken stocking event. I watched grass fires on the hill in front of our house, likely started by a discarded cigarette on the path at the bottom, burn through the prairie vegetation like fire is supposed to do, although we rarely let it do so anymore. On long drives beneath the prairie sky dome during family vacations I looked across vast fields of canola, glowing yellow under the never ending blue, and wondered what it would have been like to see Saskatchewan before fences, before the bison were gone. By my early teens I realized that the things that I was experiencing were not the way that they had always been. Despite how wonderful the world around me was, it had been diminished — sometimes in small ways, sometimes very dramatically. This is not to say, of course, that humans weren’t sometimes taking care of it and using it in good ways to feed, clothe, and shelter themselves and other humans. Rather, simply that something had been lost and that sometimes in our valid efforts to satisfy our needs we neglected the animals, plants, soil, and water in the rush to extract. Even that early in life I realized that neither I nor my children nor their children would ever experience an unfenced prairie out to the horizons, or an un-dammed Bow River. Although I didn’t call it that, I understood that there was a baseline that was now lost. And I understood that even though I wanted to imagine what had been there before I saw it, I never could truly know. I could surmise, extrapolate backward in time, and imagine. But I could never actually live it. Essentially, this syndrome has arisen because each generation of fisheries scientists accepts as a baseline the stock size and species composition that occurred at the beginning of their careers, and uses this to evaluate changes. When the next generation starts its career, the stocks have further declined, but it is the stocks at that time that serve as a new baseline. The result obviously is a gradual shift of the baseline, a gradual accommodation of the creeping disappearance of resource species, and inappropriate reference points for evaluating economic losses resulting from overfishing, or for identifying targets for rehabilitation measures. In other words, relatively short-lived humans are prone to take the current situation as the “way it always has been” and to react to that rather than to what can be often lost to the memory hole of the past. This tendency needs some form of inoculation, because no one is inherently immune. That inoculation is having people here and now who are committed to measuring the baseline and ensuring that our records travel in time to the future. It is also up to those of us who are here now to do our own time traveling to the past by making sure that we are reading those sometimes very hard won records of our predecesors. I can honestly say that I don’t fully know why I chose a career as an entomologist and ecologist. Reasons for any large life directions are usually found in multiples, and like any ecologist I know that there are very few outcomes that result from only one influence. However, I suspect what I am passionate about today had a great deal to do with my freedom to explore as a child and my primordial understanding of the lost baseline. I certainly do know that is what drives me today — specifically the hope to understand and record the small part of the world in my current backyard so that someone in the future might look back to get a glimpse of what is now to me, but what will be “what was” to them. And so that a future society can make wise choices in their management of the environment and of the resources that they need to extract. We need to catch the current baseline. We need to record it. And we need to make sure that the records move into the future after our personal constituent parts succumb to the second law of thermodynamics. No one of us can do all of that, nor could even an army of ecologists in a plethora of sub-disciplines hope to record the full baseline. The blessing of the Anthropocene is that we have access to just about any spot on the planet and we have amazing new tools that we can use to observe and record deeper than ever before. The anathema of the Anthropocene is that humanity’s joint effects are changing those spots faster than we can hope to measure them. But, despite the challenges, we need to make those measurements because without them a future that we can’t imagine won’t be able to imagine our present, their past. A few weeks ago I posted a letter that I sent to City of Prince George Mayor Lyn Hall and Council. My letter was just one small part of a massive community organizing effort regarding the proposed building of a transit facility in an urban green space. Yes our city needs a new transit maintenance facility. No, we should not be building it in green space. Today the Mayor and three councillors put out this report to council asking that at their next meeting (this upcoming Monday) council vote rescind the motions for approval of the facility in that location and instead direct city staff to work with BC Transit to find a better site for the facility. Yes, this still needs to be voted on at council, but I’m optimistic that it will pass as it already has substantial support as evidenced by the Mayor’s report. I hope that this groundswell of concern translates into a longer-term vision for preserving, expanding, and improving our urban green spaces here in Prince George – whether in our own backyard or in that of someone else. Thanks to the organizers of this effort; to Mayor Hall and Councillors Frizzell, Scott, and Skakun for taking part in the disucssion and for being responsive; and to the many citizens who voiced their opinions in a variety of venues. Let’s work to see this vision and passion for the value of our urban green spaces continue to spread like the forest canopy that we have now preserved in hope and anticipation of the benefit for future generations. I am writing to express my concerns about the proposed transit facility at 18th and Foothills. I have previously written letters about the Ron Brent development (which unfortunately went ahead) and the North College Park proposal. As with those letters, my general theme here is that green spaces and parks – particularly those that are substantially used by the public and/or that provide other important ecosystem services – should not be open to residential or industrial development. Once we lose one of those spaces, we have lost it and the valuable services that it provides for decades – essentially forever. As noted in a recent Prince George Citizen editorial, the City of Prince George has an unfortunate history of making poor decisions in situating both major and more minor developments. In the case of the proposed transit facility this is a much-needed facility in one of the worst possible locations. Please, let’s not continue the legacy of developing in the wrong locations simply because space exists. I recently attended the annual Canadian Society for Ecology and Evolution meetings in Victoria. One of the symposia that I attended was on urban ecology. The speakers were engaging, and the projects that they described were inspiring. The thing that stuck out to me the most, however, was that my own city is at least a decade behind in terms of our thinking on this subject. While other cities are preserving and rehabilitating parks and green spaces, we are looking for ways to reduce our green spaces and with it the biodiversity, ecosystem services, corridor connectivity, and recreation and health opportunities that they afford. At the symposium the point was made by Angela Danyluk (Sustainability Specialist at the City of Vancouver) that “vegetation is the foundation of biodiversity” and thus of ecosystem services. Perhaps it is because we have such a richness of vegetated spaces within and beyond our city limits that we tend to see them as expendable; but we should embrace and enhance our richness as a long term investment, not exploit it for short term gains. She presented a slide outlining a small portion of these considerations, which I have summarized as follows. Prince George seems to be growing and doubtless will grow further in the coming years. Do we want a city that is a hodgepodge of residential and industrial areas with declining green spaces that are only considered useful for their development opportunities? Or would we rather see healthy residential communities bounded by forests and parks that provide a vibrant and prosperous environment for our citizens? I know which one I’d prefer, and judging from the success of the petitioning on this topic I suspect that I am part of a much larger majority. As a daily transit user, I appreciate the attention being given to that vital public system. But it should not happen at the expense of valuable green space when there are many other options to be had in existing industrial areas. We need to move off of our current trajectory and to a more sustainable policy regarding our green spaces and parks. This means prioritizing and incentivizing infill and brownfield development instead of removing park and green space inventory. Thank you for reading this, and I appreciate the work that you do for our fine city. This letter was sent to the Mayor and Council by way of email on 17 May 2017. Three of my broadsides are on display for the next month or so in the UNBC Rotunda Gallery as part of a VIS-PO show. They’re below as part of this post (click any of the images for a larger view if needed). Please swing by to see those, as well as works by Art Fredeen, Si Transken, and Rob Budde. I have lived in the USA twice in my life and, like many Canadians, I have many friends and relatives there. Like many Canadians, I appreciate Americans and, despite obvious setbacks and flaws, I have a great respect for the values of freedom and justice that America and its allies have represented in our world. And so I am, along with many American friends and many others in many countries around the world, worried about what the next four years will bring – specifically for that great country but also for so many of us elsewhere. …one can’t live only in despair and anger without eventually destroying the thing one is angry in defense of. The world is still here, and there are aspects of human life that are not purely destructive, and there is a need to pay attention to the things around us while they are still around us. And you know, in a way, if you don’t pay that attention, the anger is just bitterness. Those of us in the scientific community, do not recoil. Those in any walk of life who love truth, do not recoil. The peaceful roads are splendid in all of their warm sun and scenery. But the harder roads of crisis provide opportunities to show the world that truth matters. It’s always more difficult to climb a long set of gravel switchbacks to an unparalleled summit vista than it is to drive a straight road through rolling meadows to nowhere in particular. Working toward truth is difficult, essential, and well worth the effort. And the effort will crowd out anger and despair. Read Whitman’s poem again on Friday – and again and again and again. Let’s continue to work for truth. The vista is there, even if we can’t see the peak from where we are now. The boy had spent the previous late-evening – when he was supposed to be sleep-dreaming – clandestine-reading Field & Stream. Cloaked in quilt. Instructions for the next-day’s project: two balsa wood rectangles, one inch by two inches by one-half inch; pen-knife-notched one-quarter inch deep by three-quarters inch wide in the middle of each; wrap a fat rubber band around one; place notches together; tighten band just so; blow; an injured rabbit screams. Now in this evening August-still, the boy sits in the front yard on a green-web-woven lawn chair and summons the rabbit. 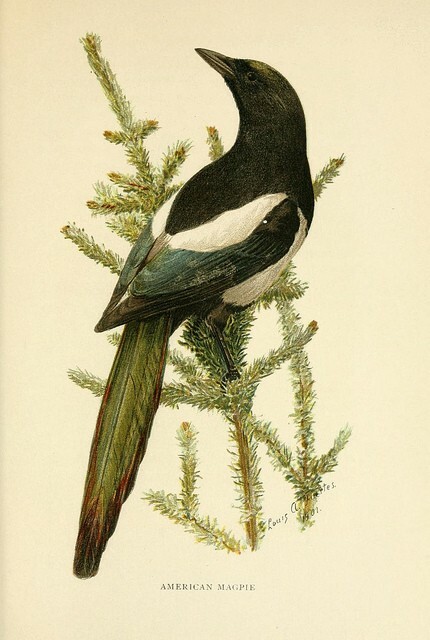 And summons magpies. One lands in the old cottonwood. Rabbit squeal. Magpie skrawk. Two magpies. Three. Four. Arriving like tuxedoed meteors. Until the branches are dappled with dancing noisy expectant iridescence. You know that moment just before you sleep? A moment you never remember when it ends in sleep, but that you feel deeply when it doesn’t. A moment on the edge, tipping. Which way? The day just passed compresses all into that one instance that seems like all instances since the world began. Since earth dust was mixed with Mars and Jupiter dust, motes breezing in the centrifugal vacuum. Since the blazing heat of coalescence. Since the first sparks of movement in that little warm pool over there. Since swimming things swam, walking things walked, flying things flew. Since this blip of consciousness; as you slip into the unconscious and for that one moment you are simultaneously all moments.